VdS is a building authority-recognised certification body (notified body) in accordance with the EU construction products regulation (CPR) and registered under ID no. 0786. VdS offers procedures for the assessment and verification of constancy of performance (system 1) in accordance with CPR during the course of a VdS recognition procedure for construction products to be used in fixed fire fighting installations. Once the process has been positively concluded, VdS will issue a “certificate of constancy of performance”, which contains a table of all the essential characteristics of the harmonised standards used as a basis, in which all the confirmed performances declared and by the manufacturer can be seen. Apart from a few exceptions, every manufacturer must draw up a declaration of performance (DoP) from 01.07.2013 onwards if a harmonised standard applies to the construction product. The “declaration of performance” replaces the former “declaration of conformity” for the construction products sector. All the essential characteristics which were specified in the hEN must be listed in the declaration of performance. A performance must be declared for a least one characteristic. Characteristics for which no performance is declared must be designated as “NPD” (No Performance Determined”). 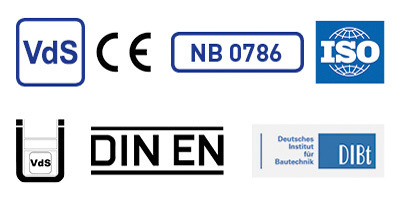 The CE marking may only apply to construction products for which the manufacturer has drawn up a declaration of performance, and in this case it is mostly the manufacturer himself who selects which characteristic he wishes to verify. Comparison of CE-labelled products is no longer possible without reference to the declaration of performance since it cannot be seen which performances a product provides without the declaration of performance. The NANDO Information System is used by the European Commission to provide information about the European member states, their notified bodies and about harmonise standards applicable to the Construction Products Regulations.